Vintage Clouds ridden by Danny Cook. Sue Smith is considering Haydock’s Peter Marsh Handicap Chase as the next target for Vintage Clouds en route to a potential tilt at the Randox Health Grand National. The nine-year-old could attempt to bounce back to form in the Grade Three contest on January 19 after being pulled up in the Welsh Grand National at Chepstow, having previously made a winning return at Haydock. Bingley-based Smith said: “Vintage Clouds is fine. Danny Cook said he was not happy on the ground at Chepstow. He goes through wet ground, but he doesn’t enjoy holding ground. Aintree is the big target for the grey after he failed to make the final cut 12 months ago. 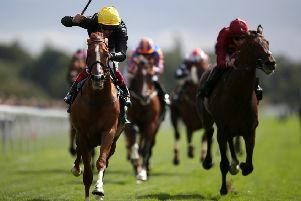 Smith, who won the National with Auroras Encore in 2013, added: “He will have an entry in the Grand National. “He just missed out on getting in last year, and I do think he is definitely that type of horse,” she added. “Hopefully we will have better luck this year. Off 146 he should get in. Willie Mullins’s nine-time Grade One winner turned 11 this week, but showed he retains all his enthusiasm when pushing Altior in the Tingle Creek. The two are on course for a rematch in a race Un De Sceaux has won for the last three years, and his owners believe very soft ground is their best chance of gaining revenge. “Looking at the forecast there’s not much rain for the next couple of weeks, it’s supposed to be cold and that just tightens up the ground. As it stands that’s his target, he’s going for four in a row and I’d love another crack at Altior. I think there’s something romantic about a rematch. “I’m not saying that we’ve any chance of beating him, but he’s entitled to take him along to the last fence. “I just think if we get proper heavy where they are thinking of abandoning the meeting that’s when we’re at our best. Un De Sceaux with Ruby (Walsh) on board takes some beating in those conditions. “I’d be happy to take on Altior if it’s like that – he’s like Ivan Drago and we’re like Rocky; we’ll keep coming back for more.